The December meeting of the Book Club will be on Wednesday, December 12, at 7:30 p.m. at the home of Susan Creagan. 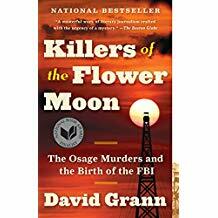 We will discuss Killers of the Flower Moon: The Osage Murders and the Birth of the FBI, by David Gran. Killers of the Flower Moon has been described as “[a] twisting, haunting true-life murder mystery about one of the most monstrous crimes in American history.” In the 1920s, the richest people per capita in the world were members of the Osage Indian nation in Oklahoma. After oil was discovered beneath their land, they rode in chauffeured automobiles, built mansions, and sent their children to study in Europe. Then, one by one, the Osage began to be killed off. Gran weaves a fascinating story about the Osage deaths and the birth of the FBI. Please note that the Book Club generally meets on the second Wednesday of each month. To RSVP for the December meeting, please e-mail Susan at susan.creagan@gmail.com, and she will provide directions to her home. For more information about the Book Club please contact Lee Lowenstein at lee.loewenstein@gmail.com or Adrienne Dominguez at adrienne.dominguez@tklaw.com. For more information about the Book Club please contact Lee Lowenstein at lee.loewenstein@gmail.com or Adrienne Dominguez at adrienne.dominguez@tklaw.com.